This article has been updated to include the full statement from Rockstar Games. It had to happen sometime. With Red Dead Redemption 2 just two weeks away, it was inevitable someone would take a closer look at Rockstar to see if it had improved its reputation for often intense crunch. The only surprise is that moment came in a relatively soft-focus "making of" piece about Red Dead Redemption 2's development. 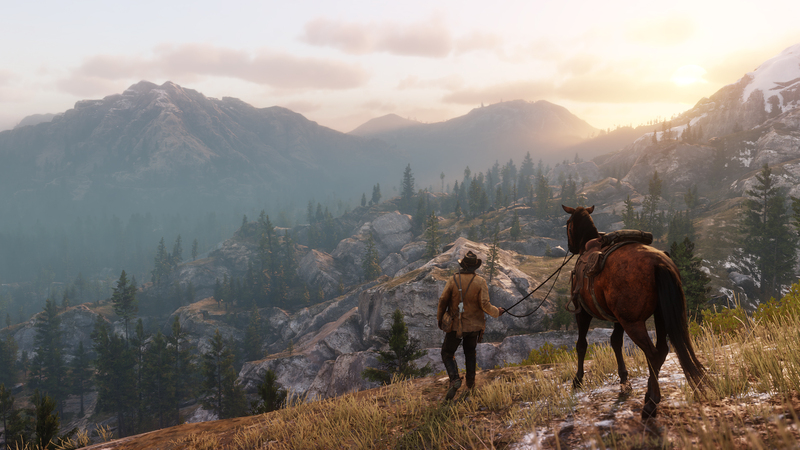 The info came directly from Rockstar co-founder Dan Houser, who made mention of working 100-hour weeks "several times" in 2018 in the course of prepping a game with some 300,000 animations and 500,000 lines of dialogue. It's pitched as a positive—the natural consequence of making a "seamless, natural-feeling experience." Amid heavy backlash on social media, Houser has since attempted to backtrack and say that the hours were limited to senior writers in a limited period of time. "There seems to be some confusion arising from my interview with Harold Goldberg. The point I was trying to make in the article was related to how the narrative and dialogue in the game was crafted, which was mostly what we talked about, not about the different processes of the wider team. After working on the game for seven years, the senior writing team, which consists of four people, Mike Unsworth, Rupert Humphries, Lazlow and myself, had, as we always do, three weeks of intense work when we wrapped everything up. Three weeks, not years. We have all worked together for at least 12 years now, and feel we need this to get everything finished. After so many years of getting things organized and ready on this project, we needed this to check and finalize everything." "More importantly, we obviously don't expect anyone else to work this way. Across the whole company, we have some senior people who work very hard purely because they're passionate about a project, or their particular work, and we believe that passion shows in the games we release. But that additional effort is a choice, and we don't ask or expect anyone to work anything like this. Lots of other senior people work in an entirely different way and are just as productive – I'm just not one of them! No one, senior or junior, is ever forced to work hard. I believe we go to great lengths to run a business that cares about its people, and to make the company a great place for them to work." Red Dead Redemption 2's grand visuals may be coming at a heavy cost. Nevertheless, the furor continues, fueled in part by heightened awareness of games industry labor practices, which has sparked debate over the need for unionization. It's also fueled by Rockstar's often problematic track record. It recalls the similar outrage over the original Red Dead Redemption, which included allegations of abusive behavior, long hours, and low morale. One Rockstar San Diego developer famously called Rockstar's New York office "the Eye of Sauron" because of the way it would suddenly turn its eye to one of its satellite studios and order sweeping changes to one of its projects. In early 2010, just a few months before Red Dead Redemption's release, a writer penned a blog post on Gamasutra under the handle "Determined Devoted Wives of Rockstar San Diego Employees"—a reference to the infamous "EA Spouse" articles that exposed EA's labor practices. It alleged a "thirst for power" amid the management structure and even threatened legal action if working conditions didn't improve. In the last years, there have also been many cuts on benefits despite the increasing demands on employees. After dedicated hard work on a project, weeks of comp time were offered as a reward and illustration of appreciation and understanding. Far from what is currently being met by the employees after nearly a year of constant strenuous activity. Little is there to motivate continuation as they also have lost a free vacation week between Christmas and New Year. Without time to recuperate and no efforts made to alleviate the stress of such conditions would procure on an employee after a period time, serious health concerns. Yet, now the health concern becomes another financial concern as the stripping of medical benefits surfaces to realization. Red Dead Redemption, of course, went on to enjoy rave reviews. But the allegations of poor working conditions at Rockstar haven't been entirely forgotten. A few months after its release, another former Rockstar employee came forward with stories of their own. Amid a surge of positive previews for Red Dead Redemption 2, Kotaku's Jason Schreier reminded everyone of this troubled history. Glassdoor offers further evidence that little has changed since the original controversy in 2010. While many reviews refer to the excitement of working on high-profile games like GTA and Red Dead Redemption, many others complain about the lack of work-life balance and "extreme overtime." One review claiming from 2016 titled "Great games, great developers, poor management" claims, "You will get to work on some of the most highly-anticipated and highest-rated games in the industry, but will come at great cost to your personal life. Rockstar puts their work first and foremost and it is expected that every employee does the same. 50 hours is a minimum work week for many even outside of official crunch time. Work during the weekend or being on-call with a work phone for even non-senior staff is a regular occurrence as well." Another review written in March 2018 alleges, "The company made billions of dollars through SharkCards last year, but they keep telling us that there is no money for a Christmas party, or for bigger bonuses." Unfortunately, this culture is widespread through not just gaming, but tech in general. Anyone living in a major tech hub probably has a hollow-eyed friend who relates stories of toxic work cultures and extreme expectations (I sure do). But contrary to the established narrative, it doesn't need to be this way. Just recently our sister site Gamesindustry.biz celebrated the Best Places to Work in Gaming, highlighting Rocksteady, Creative Assembly, and Playground Games among other prestigious studios. When Red Dead Redemption 2 launches on October 26, it will no doubt earn incredible reviews and sell millions of units. It will almost certainly be crowned Game of the Year on many sites. But it will be another reminder of the industry's continued struggle with burnout and ridiculous overtime; a field where 100-hour work weeks are touted as a point of pride, a sign of a game's quality, rather than as a sign of a troubling culture of crunch. And until that changes, it deserves to be called out whenever possible. Soulcalibur returns after a lengthy hiatus this week. Lego DC Super-Villains [Switch, PS4, Xbox One, PC, October 16]: It's another Lego game starring licensed superheroes! The kids will no doubt love it. Starlink: Battle for Atlas [Switch, PS4, Xbox One, October 16]: The "toys-to-life" genre is dead as a doornail for the most part, but Ubisoft is still determined to make a go of it. The Star Fox tie-in is admittedly pretty neat. Look for our coverage tomorrow. Dark Souls Remastered [Switch, October 19]: Dark Souls Remastered finally makes its way to Switch after a relatively lengthy delay. It's a welcome addition to the Switch's library, even if the online component won't exactly mesh with the Switch's portability. Read our review here. Soulcalibur VI [PC, PS4, Xbox One, October 19]: This sure snuck up on us, didn't it? The beloved fighting game series returns this week with a lot of familiar faces, with Geralt from The Witcher serving as a special guest star. 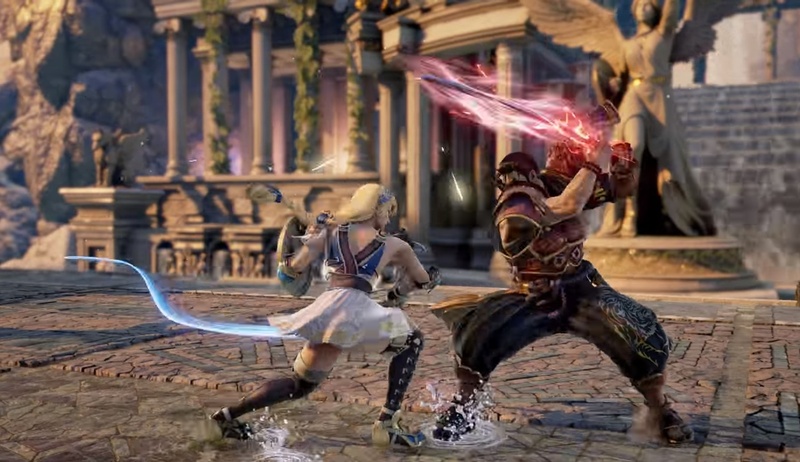 It's unlikely to be a wholesale revival for Soulcalibur, but it's nevertheless been missed. Hopefully it'll be out on Switch sooner rather than later. Chronopolis plays a very important role in Chrono Cross for the PlayStation. See, it's—yeah, forget it. I'm not even trying to untangle the story significance of Chronopolis. It starts off easy enough with "Belthasar from Chrono Trigger made it as a time travel research station," but I get lost around "Serge and his father intruded, and Serge's father was subsequently turned into a panther-man because of Reasons related to Fate." I guess it's fun to puzzle over if you have the time to spare on Fandom Wiki. I recommend clearing your schedule and going in with a nice cup of tea. The important thing is, Chronopolis' music is eerie, heavy and lonely. Composer Yasunori Mitsuda is pretty great at capturing the dread that surrounds dead-but-important places: The Land of Morytha from Xenoblade Chronicles 2 is another great example. If you listen closely, though, you can hear Chronopolis also pays tribute to Secret of the Forest from Chrono Trigger. There's a bit of the ever-foreboding Black Omen in there, too. Neat! In the midst of every year, in Japan a cool art exhibit is held. It's the My Famicase Exhibition, where artists from all over the world illustrate their dream ideas for fictional Famicom games. The winning selections are then printed out, and put onto Famicom cartridges before going on display. It's a lovely exhibit, one I've always wanted to see in-person and not just through online galleries. And recently, a game jam has formed around it too: the A Game By Its Cover jam, where some developers try to bring the fictional games to life. My pick for this week's alternative game wasn't published in the last week or whatever, as I try to typically stick to, but it's lingering on the front page of itch.io, so I figured I might as well try it out. It's immediately adorable, as you play as a little frog surfing to safety. That's basically the whole game from developer Sergio Barrio Slocker: Racing sick waves while the sun sets and turns the sky a nice shade of pink, while trying not to crash. It's a cute little experience. You can play Wave for free from your browser on itch.io, or on iOS and Android too. I played a bunch of Smash Bros. with friends over the weekend. We were scattered all over the living room, some on the floor and some on the couch, in an effort to accommodate the varying cord lengths of our Gamecube controllers. It reminded me that Smash Bros. is the only game series with a direct, tactile connection to the past. When I was unwrapping my GameCube controllers, I was transported back to college, where a similar scene unfolded as I played literally thousands of hours of Melee with my friends. That tradition will continue with Smash Bros. Ultimate, and it continues to blow my mind. In the meantime, Black Ops 4 is out now, and it's already doing ludicrously well. The new Battle Royale mode will be credited with its success, but the sheer popularity of Zombies shouldn't be discounted either. People are absolutely bonkers for that mode in a way I'm not sure I'll ever entirely understand. Yesterday, was the 10th anniversary of Dead Space, and while the studio that created it is long gone, its still elicits fond memories. Freelance contributer Piotr Bajda talked to one of its key creators for a lengthy retrospective about the series, which you can find here. Apparently a messaging bug is bricking some PS4s, forcing their owners to reset to factory settings. Sony is working on it. Until then, beware of random incoming messages. In case you missed it, I added Fallout: New Vegas to our ongoing Top 25 RPGs list. We're almost to the Top 10 now, and the names are only going to get bigger. Stay tuned! Your moment of zen for Monday. Axe of the Blood God: Caty and Mike join Nadia and I reviews of The World Ends With You Switch and Assassin's Creed Odyssey! Plus, Nadia is out of Twitter jail. Subscribe here! Tagged with Feature,	rockstar,	Starting Screen.